On the pitch City picked up one point from 12 and now find themselves at risk of being cut off in the bottom three. Other sides like Newcastle (6 pts), Palace (4 pts), Burnley (8pts) and Southampton (8 pts) had much more productive months. Fulham picked up a win after three defeats. The worse teams in January - formwise - were Huddersfield & Cardiff whose only points came from a drab 0 - 0 draw with each other. One other side, Brighton, also only picked up a single point but still have a seven point cushion over the bottom three. 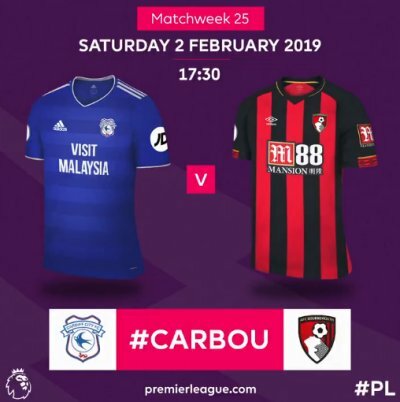 February also has four Premier League games for Cardiff and three of them are at home. Starting with Bournmouth on Saturday City then face Southampton away next week before a home double header with Watford and Everon in the space of 5 days. February will be a pivotal month in the hope of Premier League survival. Cardiff's Deadline Day signing Leandro Bacuna is expected to make his home debut. Bacuna is set to replace Harry Arter with the Republic of Ireland midfielder unable to play against his parent club. Victor Camarasa and Josh Murphy, who both missed the 2-1 defeat to Arsenal on Tuesday, will be assessed. Bournemouth must cope without top goalscorer Callum Wilson again because of a knee problem. Midfielder Jefferson Lerma (ankle) faces a late fitness test, while January signing Dominic Solanke, who was on the bench for the midweek 4-0 win against Chelsea, could be given a debut after overcoming a hamstring problem. Cherries captain Simon Francis and midfielder Lewis Cook (both knee) remain long-term absentees. Bournemouth have lost their last six away Premier League games, conceding at least twice each time. They've not lost seven in a row on the road in league football since October 1994. On the day of this match, it will be 19 years and 102 days since Cardiff manager Neil Warnock hosted Bournemouth in a league match - a 2-2 draw as Bury manager at Gigg Lane in October 1999.